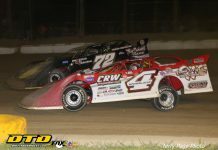 DELEVAN, NY – Big Dog Saturday II at Freedom Motorsports Park featured the fifth annual Mike “Duke” Duclon Memorial and the rich Murphy’s Logging ULMS Super Late Model feature was captured by Max Blair. Other winners on Upstate Auto Group, Close Racing Supply, Murphy’s Logging and Previty’s Auto Wrecking Big Dog Saturday II were Billy Van Pelt in the Primetime Energy Services Outlaw Modifieds, Andy Eastman in the Cummings Trucking Street Stocks, Duane Powers in the Danny Heineman & Sons Mini Stocks and Dustin Skinner in the Bandits. 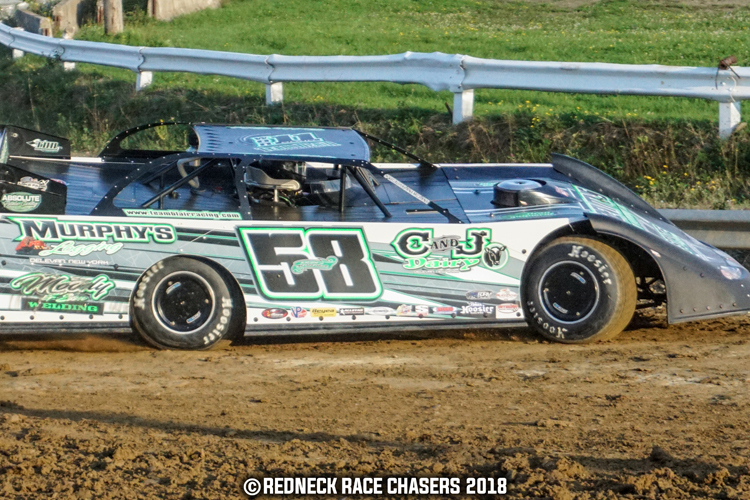 The Murphy’s Logging ULMS Super Late Models kicked off their night with time-trials and it was Boom Briggs who set a new track record of 13.696 to earn the $300 fast time award from Murphy’s Logging. Briggs and Blair captured the two heat races. 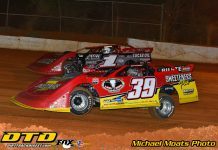 The popular six car Super Late Model versus Outlaw Modified match race was taken by Blair over Dillon Groover. Blair picked up $500 for the win. 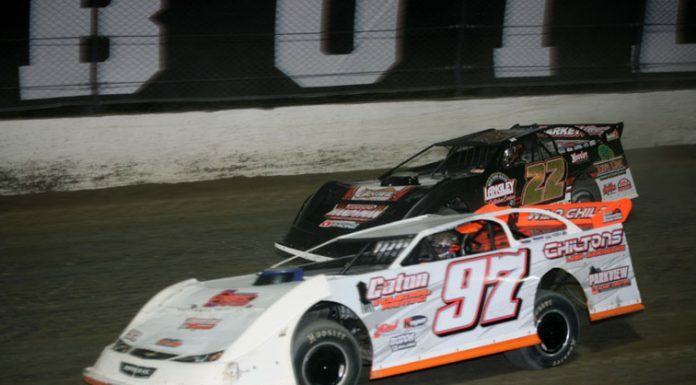 It was a stacked front two rows at the start of the ULMS Super Late Model Mike “Duke” Duclon Memorial as the redraw set up Chub Frank and Blair on row one and Briggs and Greg Oakes on row two. Previous winners of the memorial race were Mike Wonderling Sr., Bruce Miller, Dave Dubois and Max Blair. 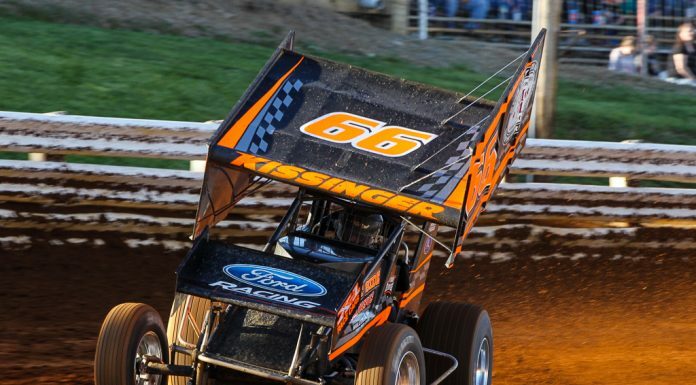 At the drop of the green, Blair used the top side of the track and bolted around Frank to grab the lead as the race was slowed for a Zach Weich spin in turn three. On the Delaware style restart, Blair jumped out front as Oakes took second one lap later from Frank with an inside pass off turn four. Blair began to distance himself from the side by side battle for second (Oakes and Frank) and fourth (Briggs and Mike Wonderling). On lap six, Frank retook second from Oakes and Briggs worked his way by Wonderling for fourth. Halfway found Blair with a commanding lead over a tremendous race for second between Frank and Oakes with Briggs and Wonderling fourth and fifth. Oakes reclaimed second from Frank on lap 23. The complexion of the race changed on lap 27 as Doug Eck brought out the second and final caution of the race which erased Blair’s lead. It was a three lap shootout for the win and on the restart, Frank blasted past Oakes for second and set his sights on Blair. Frank got a big run off of turn two with two to go that was repelled by Blair. As they took the white flag, Frank went for the win in turn one on the high side but jumped the cushion which allowed Oakes to retake second. Oakes had one last shot in turn three on the final lap but Blair was able to take the one car length victory over Oakes, Blair, Briggs and Wonderling. Blair, of Centerville, Pennsylvania, racked up winnings that totaled $4058 as he received a $500 bonus for winning the match race and feature. Blair’s car featured a number change to 58 to honor Mike “Duke” Duclon. 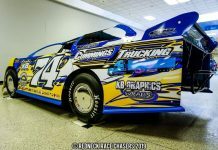 Primetime Energy Services Outlaw Modified champion Billy Van Pelt sold his championship winning car on the final night of the regular season. For Big Dog II, Van Pelt jumped into the Wally Wade Outlaw Modified. Van Pelt took the top spot at the start of the Outlaw Modified feature followed by Patrick Emerling, Shannon Whaley, John Venuto and Phil Vigneri III. Emerling and Whaley were door handle to door handle for second as Van Pelt led the early portions of the feature. Halfway found Van Pelt pulling away with Emerling, Whaley, Vigneri III and James Sweeting the top five. A big accident on the homestretch brought out the red on lap 18 as John Smith flipped after contact with Dillon Groover. Smith was ok.
Van Pelt got the jump on the restart and caution was out quickly as Whaley, Scott Wood and Ron Cartwright Jr. tangled in turn one. The rest of the 30 lap affair featured tremendous racing as Emerling, Whaley and Sweeting swapped positions. As the laps wound down, Van Pelt’s lead began to shrink. Emerling closed fast with one lap to go but Van Pelt of Westfield, Pennsylvania was able to hold on for the half car-length win over Emerling (his best ever dirt finish), Vigneri III, Sweeting and Venuto. It was $1000 to win on the line in the Cummings Trucking Street Stocks and after a race long battle, Andy Eastman of Delevan used a last lap pass of Bill Taylor to take down his first ever Street Stock win. Taylor, Bill Demick, Joe Chamberlain and Justin Baxter completed the top five. It was a two car battle for the checkered flag in the Danny Heineman & Sons Mini Stocks as Duane Powers and Don Whiteside exchange the lead numerous times. Powers of Belfast was able to pass Whiteside on the last lap to take the win and put the icing on his championship season. In the accompanying Bandit feature, Dustin Skinner of West Clarksville took the checkered flag. ULMS MURPHY’S LOGGING SUPER LATE MODELS MIKE “DUKE” DUCLON MEMORIAL (30 Laps) – Max Blair, Greg Oakes, Chub Frank, Boom Briggs, Mike Wonderling, Nathan Hill, Brad Mesler, Andy Boozel, Jason Dobson, Al Brewer, Doug Eck, Zach Weich. PRIME TIME ENERGY SERVICES OUTLAW MODIFIEDS FEATURE- (30 Laps) – Billy Van Pelt, Patrick Emerling, Phil Vigneri III, James Sweeting, John Venuto, Steve Schumacher, Steve Schumacher, Jimmy Holden, Ron Cartwright Jr., Nick Joy, Scott Wood, Brad Rapp, John Smith, Dylan Groover, Greg Martin, Tony Pangrazio. CUMMINGS TRUCKING STREET STOCKS-$1000 To Win (20 Laps) – Andy Eastman, Bill Taylor, Bill Demick, Joe Chamberlain, Justin Baxter, Ted Mascho, Bill Tice. DANNY HEINEMAN & SONS MINI STOCKS (15 Laps) – Duane Powers, Don Whiteside, Kane Stebbins, Holden Heineman, Billy Williams, Tyler Pastorius, Bradley Steffenhagen, Ray Hyer, Tim Eastman.